Rafa Benitez has revealed that he wants to emulate his Liverpool triumphs at Newcastle United. But the manager stopped short of giving any assurances about his long-term future at the club. Today marks exactly a year since Benitez took the reins at St James’s Park. While the appointment was a surprise, what is probably more remarkable is that the Spaniard is still here, despite the club suffering relegation to the second tier. 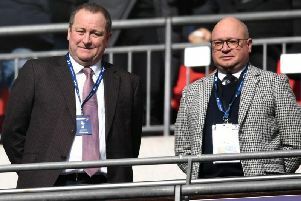 And having done a year in the Magpies’ top job, the question on everyone’s lips is whether he will last another, especially given the club’s inability to deliver on promises given to the former Real Madrid and Chelsea boss. And while Benitez was coy when asked whether he will still be at St James’s in a year, he did give some indication to his ambitions at the club, should United’s hierarchy dance to his tune. Ahead of today’s potentially crucial Championship clash with Fulham, the manager opened up about his aims at United. “I was at Liverpool for six years, we won the Champions League in the first year. We played in the final of the Carling Cup at this time. We had won titles, finals, semi finals and whatever and the adoration grew and grew,” he explained. “It is very similar here. Hopefully we can do well and we can have the same number of years and trophies. Expanding on the future, Benitez continued: “We are moving in the right direction. “We need to make sure we are moving as fast as we can. We have to change things. “I don’t know what will happen. Similarity is clearly something that attracted Benitez to United. He admits that he knew of their fanatical fanbase, but one thing that has surprised him is the fervent nature of their support. Benitez likens it very much to the kind of support he enjoyed at Anfield. “There are similarities between the Scousers and the Geordies,” he said. “They trust you. It is easy to see the similarities. “They support the team. If they do that the team will be better. “We’re in the Championship but this is still a massive club. “You must have a winning mentality but also be humble – we are not up yet. While Benitez will give no firm answer regarding his future, that does not mean he is a manager who will rest on his laurels. Off-the-field plans will implemented with a return to the Premier League very much on the agenda, and changes on it are a certainty. Plans are being drawn up, with summer targets listed and departures planned. “We have been working the way a club has to,” Benitez explained. “We have been talking about players for the future, but we do not know where we are yet. “We are not making decisions but we are talking.